NEW ORLEANS, Louisiana, June 3, 2010 (ENS) – President Barack Obama is planning a third trip to the Gulf of Mexico on Friday for another look at the federal response to the massive Deepwater Horizon oil spill that has now come ashore in Alabama, Mississippi and the Florida Keys as well as in Louisiana. BP announced Wednesday that it supports the U.S. government’s decision to proceed with construction of six sections of sand booms to keep oil off the Louisiana barrier islands. The company will fund the estimated $360 million it will cost to construct the six sections. 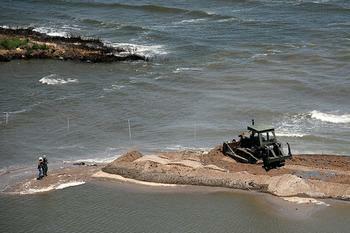 Louisiana Governor Bobby Jindal said today that the state is executing an emergency contract to immediately begin mobilizing dredges and start work on the six sand-boom segments approved by the White House. BP said in a statement Wednesday that the company will not manage or contract directly for the construction of the island sections, nor will the company assume any liability for unintended consequences of the project. The company plans to make payments in stages based on the project’s milestones. “BP is committed to implementing the most effective measures to protect the coastline of Louisiana and reduce the impact of the oil and gas spill in the Gulf of Mexico. The federal government and the state of Louisiana have agreed that the barrier islands construction is an effective response to the spill, and we look forward to working with them on this project,” said Tony Hayward, BP’s chief executive officer. BP today successfully cut through a pipe on the seafloor to allow the placement of a containment cap on the damaged wellhead that is still gushing thousands of barrels of oil into the gulf every day. An attempt to cut the pipe yesterday failed. Working with remotely operated vehicles 5,000 feet under the water’s surface, BP expects to fit the containment cap over the leaking wellhead to capture the oil and gas mixture and send it up a pipe to a ship on the surface. There, the oil will be stored for eventual refinement into products, the gas will be flared off, and any water in the mix will go back into the gulf. In addition to the cap containment system, BP also intends to use the hoses and manifold that were deployed for last week’s failed “top kill” operation to take oil and gas from the failed Deepwater Horizon blowout preventer through a separate riser pipe to an intervention vessel on the surface. This system, which is expected to be available for deployment in mid-June, is intended to increase the overall efficiency of the containment operation by possibly increasing the amount of oil and gas flow that can be captured from the well. The next planned operation will provide a more permanent system by directing oil and gas to a new free-standing riser ending about 300 feet below sea level. A flexible hose then will be attached to a containment vessel. The Atlantic hurricane season began on Tuesday, and this longer-term option is designed to permit the system to more effectively disconnect and reconnect the riser to provide the greatest flexibility for operations during a hurricane, BP said. Implementation of this enhancement is expected in late June or early July. 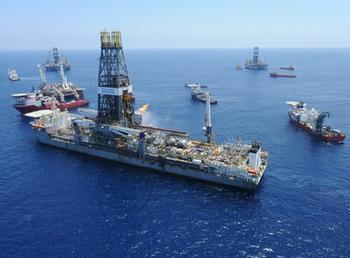 Two relief wells are being drilled, and Admiral Allen said today that both are on schedule. The first relief well is expected to be complete around August 2, three months after drilling started. The Obama administration today sent a preliminary bill for $69 million to BP and other responsible parties for response and recovery operations relating to the BP/Deepwater Horizon Oil Spill. The bill covers the activities of more than two dozen federal entities and agencies from three states and for costs incurred by the federal on-scene coordinator to support federal, state, and local response efforts. The administration issued a statement saying it will continue to bill BP regularly for all associated costs to ensure the Oil Spill Liability Trust Fund is reimbursed on an ongoing basis. To provide full transparency of the ongoing efforts and to ensure that the American public is not held accountable for the costs of response and recovery activities, the federal government will bill BP and the other responsible parties periodically. The administration expects prompt payment and will take additional steps as necessary to ensure that BP and other responsible parties, not American taxpayers, pay all of the costs associated with the BP/Deepwater Horizon Oil Spill. The United States Coast Guard is responsible for administering the Oil Spill Liability Trust Fund to ensure that individuals and communities harmed by oil spills are made whole and that the costs of response and cleanup are borne by the responsible parties. BP already has provided $170 million to Louisiana, Alabama, Mississippi, and Florida to help with their response costs and help promote their tourism industries. 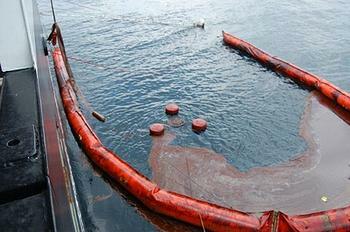 The company also has paid approximately $42 million in compensation to people and companies affected by the spill. Admiral Allen has ordered Coast Guard vessels and helicopters to protect Alabama from the oil spill. The Coast Guard Cutter Cypress arrived in Mobile Bay Wednesday to protect Dauphin Island from the north and west.